The first step is to retrieve data from source systems. 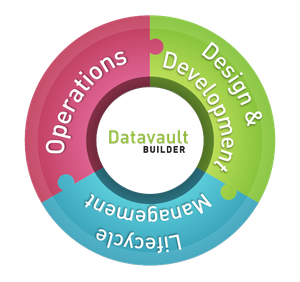 Quickly add a new source and immediately copy the data into the staging-area of the Datavault Builder. Take advantage of the possibility to view the data before and after loading, quickly check data quality or determine top occuring terms. Connect to any JDBC-enabled database, such as MS Access/Excel/SQL, Oracle and IBM DB2. Now the integrated Core Warehouse, the Datavault, is modelled with the unique Graphical Modelling Editor. Map the data from the staging into the historized Datavault as permanent storage and directly create automatable loading procedures. As a final step, the data is prepared for delivery to target systems. Easily compose Business Objects and realize custom Business Logic to supply the information in the exact state as it is needed. To round it up, either kick on the automatically prepared load job with the click of a button or define custom jobs with individual triggers and schedules to feed in new data.